Volunteers extend the resources of Extension as they work with staff to deliver educational programs. Volunteering is a privilege. For more information and an application to volunteer, contact the 4-H Youth Development staff member in your County Extension Office. 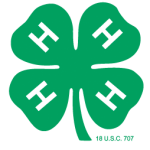 Youth and adults are invited to submit a seminar proposal for teaching at the Wisconsin 4-H & Youth Conference. Adult Advisors – are 4-H volunteers who have a combination of chaperone and coordination responsibilities for 4-H Youth Development experiences. This may include Citizenship Washington Focus, Space Camp, National 4-H Congress. Adults interested in these experiences must complete the Adult Advisor Application. Chaperones – for 4-H youth development experiences must have completed the Youth Protection Process; be enrolled 4-H volunteer leaders and be over 21 years of age (for some experiences adults must be over 25).